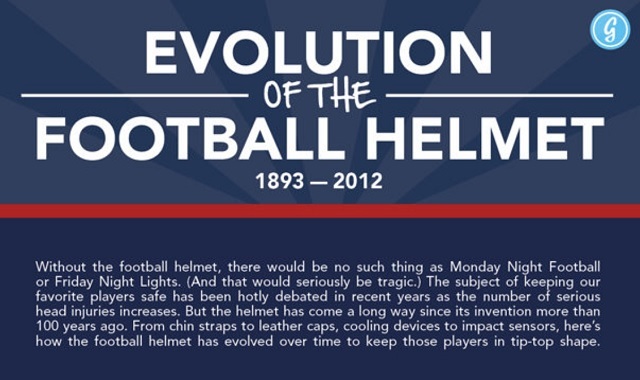 The Evolution of the Football Helmet #infographic ~ Visualistan '+g+"
Without the football helmet, there would be no such thing as Monday Night football or Friday Night Lights. (And that would seriously be tragic). The subject of keeping our favorite players safe has been hotly debated in recent years as the number of serious head injuries increases. But the helmet has come a long way since its invention more than 100 years ago. From chin straps to leather caps, cooling devices to impact sensors, here's how the football helmet was evolved over time to keep those players in tip-top shape.